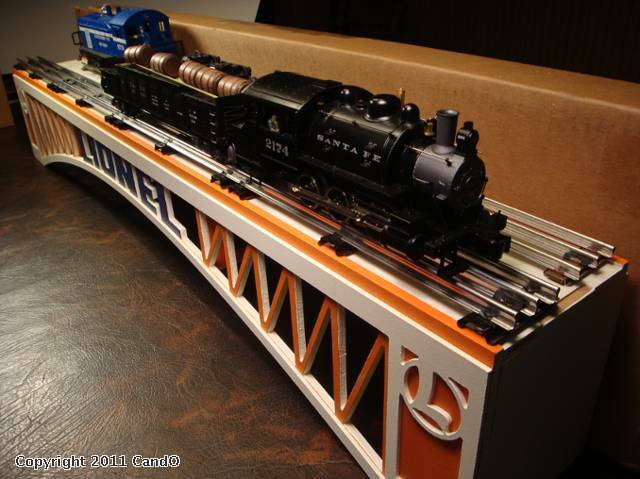 I've been wanting a TW Trainworx Lionel bridge for quite some time, but I kept holding off purchasing one. My wait paid off because a few months ago as they had a sale and a new bridge design...the B55 which has "Circle L" logos at both ends. The B55 is 40" long x 5-1/4" wide x 6-3/8" high. These bridges are in kit form and made of MDF. They need a little sanding/filing before paint and assembly can be done. This B55 bridge was very easy to put together. Wood glue is all that is needed to attach the pieces. The B55 is meant to be a single track bridge. For now, I will be using it on top of a display shelf so two tracks will be fine. While looking for inspiration on colors to use for my bridge, I searched OGR. I really liked the classic green bridge with cream lettering...I found a few of these on OGR. 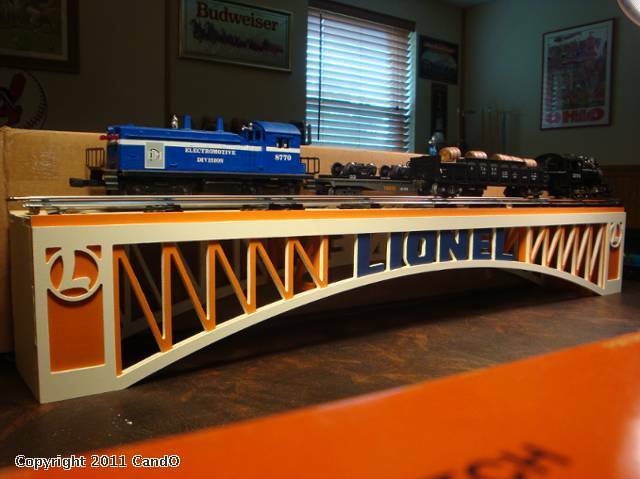 I came across a member's photo album of his TW Trainworx B51 bridge done in Lionel colors...orange, blue, and cream. He matched the colors to a Lionel rolling stock package. This was a neat idea and I decided that I would also like to do this. I color matched the bridge's "LIONEL" lettering to Lionel blue on a package...I didn't need much, so I only bought a sample size. The orange was harder to match, but I found a very close paint at Home Depot. 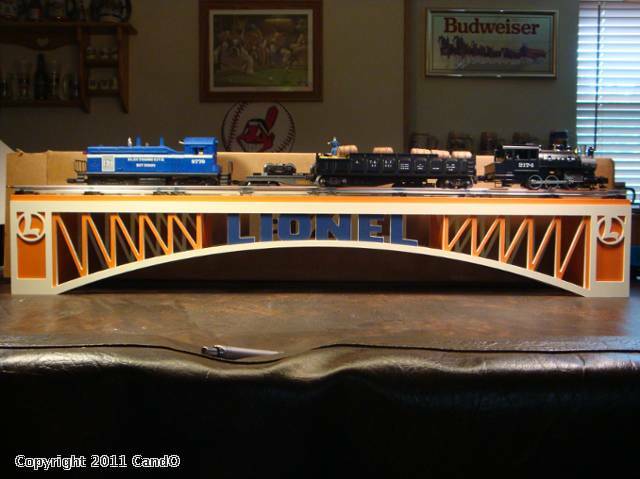 I decide not to match the cream to the Lionel package. I chose to use a much lighter cream color instead. I wanted the bridge to be cream overall and the orange to be the accent color. Blue only went on the LIONEL lettering. interesting that in home depot at gliden samples there are a lot of railroad colors. Nice looking bridge, and I commend you on color choice. Thanks for sharing!